The power grid handled the total solar eclipse like a champ. Peaker plants, hydroelectric generators, and battery backup units compensated for the temporary shortage of photovoltaic power, which, for all practical purposes, behaved like it would on an overcast day. So I thought I'd diverge a bit and tell you about my family's quest to witness totality. After all, engineers are often inspired by science. Like many engineers, my interest in the field stemmed (no pun intended) from an early fascination with science and a healthy obsession with Star Trek. As far back as I can remember, I was looking through my family's old set of encyclopedias, gazing at the drawings of the planets. (This was years before the Voyagers even launched, so there weren't any good photos of our celestial neighbors at the time.) Science was my favorite subject in school - the only subject, in fact, that I liked at all. "Scotty," the chief engineer aboard the NCC-1701 (United Space Ship Enterprise), is the reason I knew the term "engineer" outside the context of someone who drives a train. As a college student in the early-1980s, I joined The Planetary Society, which had recently been founded by the great science educator Dr. Carl Sagan. (For the younger crowd, Carl Sagan was my generation's Neil deGrasse Tyson.) In 1986, Halley's Comet made its once-in-a-lifetime appearance in our part of the solar system. I went out to observe, but I didn't know my way around the constellations at the time. I may have seen a tiny smudge in the general vicinity of where the newspapers told me to look, but I can't be sure. After grad school and some time as a design engineer, I left industry to pursue a career in academia. My wife and I moved to the Midwest, and while visiting the local observatory on a public viewing night, I decided to pursue amateur astronomy as a hobby. I didn't have long to wait before my first celestial event: the total lunar eclipse of August 16, 1989, which we enjoyed from our back yard. January 2017 (T minus seven months, give or take): I spend a few hours looking at eclipse maps, figuring out where to watch it with the shortest travel. I select Waterloo IL, fifteen miles southeast of St. Louis MO. Totality occurs at 1:17 PM so we could drive down in the morning and drive back in the afternoon, but I have visions of being stuck in a traffic jam ten miles outside the totality region at zero-hour. We decide to reserve a motel room and arrive a day in advance. I order eclipse glasses. We only need three, but I buy a five-pack … just in case. Sunday, August 20, 9:47 PM (T minus 14:30): Check into motel. Watch weather forecast. Scattered clouds and possible thunderstorms. I'm officially worried. Monday, August 21, 9:00 AM (T minus 4:17): Weather forecast looking a bit more positive, but still "iffy." While having breakfast, we meet a family of amateur astronomers. (Dad is a technician; Mom is a college professor; Son just graduated high school.) They have a telescope (with a filter, of course) and are planning to set up outside the motel. They're inviting everyone to join them. 10:00 AM (T minus 3:17): Aforementioned family sets up and a small crowd gathers. Lots of people wearing eclipse T-shirts. I didn't buy one, but I show my geek pride by sporting a NASA tee. 11:00 AM (T minus 2:17): We join the motel parking lot party. Clouds in the distance. Temperature approaching 95 degrees Fahrenheit; humidity at 95%. The family of amateur astronomers has a nice telescope with an equatorial mount and a tracking motor. When they add their camera with telephoto lens, the additional weight causes the mount to become unbalanced. Time for a little mechanical engineering: they attach a hammer to the counterweight for extra ballast. Through the telescope, we can see six distinct sunspots. Very cool! Amateur astronomers are eager to share knowledge with the general public, so the family encourages everyone to look through their scope while we all answer eclipse and general astronomy questions for the folks around us. One couple is sharing a pair of protective glasses. I brought a couple extras because I'm my mother's son. (My family will understand that.) I give them a pair. 1:00 PM: (T minus 0:17): It's noticeably dark, like a storm is rolling in. But the threatening clouds are far away; the ensuing darkness is due to the sun being 90% blocked by the moon. This thing is gonna happen! 1:17 PM: Protective glasses off. It's TOTALITY, baby! 1:19 PM: We see the "diamond ring" indicating the end of totality. (That was a fast two minutes.) Venus is still visible for a minute or so, while the other planets disappear right away. We stay another twenty minutes, say goodbye to our impromptu cohort group, and hit the road. Almost eight hours to drive back. (Two hours to move the first thirty miles.) At every rest stop, we see people in various "science geek" shirts. Instant bonding. "Where did you watch it?" "Did you have clear skies?" "Was this your first one?" Nobody seems to care about the traffic; we're all grinning, knowing that we just witnessed a cosmic coincidence that most people will never experience. While we were hoping to make it home before nightfall, the traffic was less than cooperative. That's okay because Mother Nature treated us to an absolutely gorgeous sunset to our left and a nighttime thunderstorm light show (in the distance) directly in front of us. We got a little rain for the last fifteen minutes, but the storms passed before we got home. Upon arrival, I felt like a ten-year-old who just got home from the amusement park. 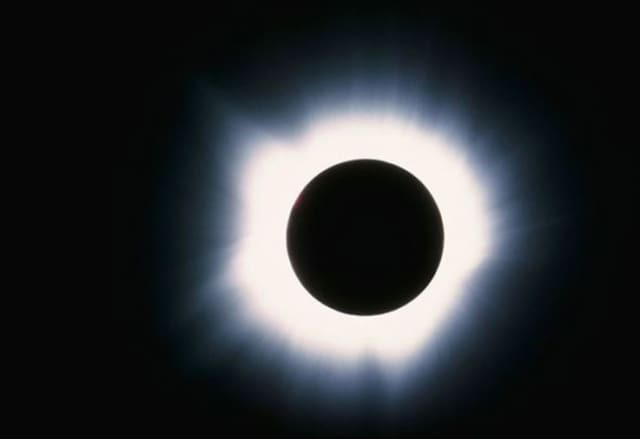 Have you seen a total solar eclipse? Share your experience by commenting below!